Brussels, October 1927. 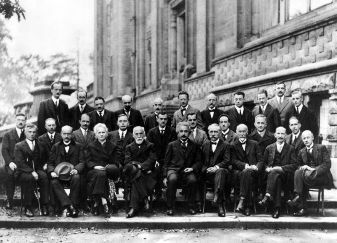 Picture taken at the 5th Solvay conference. What are "properties" of a quantum mechanical system? I have collected some material on the history (and interpretation) of quantum mechanics. Many original paper can be found here. Links to secondary literature on the history of quantum mechanics are collected here. It is widely held that the measurement problem is the central problem of quantum mechanics. As far as I can see, the different interpretations of quantum mechanics can even be classified according to their way how they tackle this problem. Here you can read more. Somewhat related is the question of the classical limit of quantum mechanics. Some resources on this question are collected here. Here I have collected some remarks and references on one of the most fundamental departures from classical physics which QM introduces: the concept of a "property". I have written a (German) textbook on a rather less known interpretation of quantum mechanics. It is called the de Broglie-Bohm theory or Bohmian mechanics for short. It allows what is usually regarded as impossible, namely a deterministic description of quantum phenomena in terms of particle trajectories. An introduction to the de Broglie-Bohm theory and possible generalizations to quantum field theory: What you always wanted to know about Bohmian mechanics but were afraid to ask. This is the write-up of a talk I have given at the spring meeting of the German Physics Society in Dortmund 2006. A little note about objections against this interpretation: "Why isn't every physicist a Bohmian? ", quant-ph/0412119. A paper praising the didactical virtues of the de Broglie-Bohm theory: "How to teach Quantum Mechanics", quant-ph/0404128 (Eur. J. Phys. 25 (2004) 765). If somebody would like to have an introduction into the de Broglie-Bohm theory, the following article in the Stanford Encyclopedia of Philosophy is a good starting point. The slides of a talk which I have given at the spring meeting of the German Physics Society in Dortmund can be downloaded here (PDF, German). Understanding Niels Bohr's interpretation of quantum mechanics seems to be a tricky business. Here I have tried to provide some guide to the recent literature. Given the perplexing number of different interpretations of QM it seems promising to investigate their relation. Perhaps some turn out to be not so radically different after all? Look here for some material on the topic.